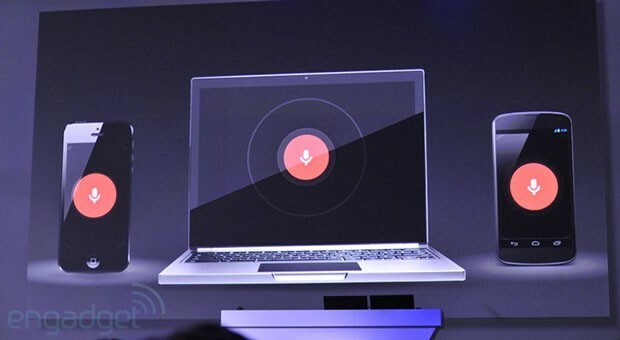 After revealing it at I/O 2013 only days ago, Google's new conversational voice search function is up and running on Chrome 27. If you've got that version, you'll now get a spoken response on top of a web page display when using the voice search function (the microphone in the main search window), for starters. More interestingly, the new feature also includes semantic search, meaning you can ask follow-up questions without repeating needless info -- for instance, "who's the CEO of GE?" can now be followed up with "how old is he?" and Google will know who "he" is. We gave it a spin for ourselves and found that when it worked, it worked well, however, the system may be overwhelmed by the launch and is giving us a "no internet connection" message most of the time -- not exactly what we're looking for.